Today, the mobile app ecosystem is one of the biggest technology, with over 6 million of mobile apps present in the mobile app store. Throughout 2017, businesses have realized that adopting a mobile app strategy in no longer trendy investment, but a necessity to survive in the market. With this list of mobile app development trends, you’ll know what to look out for, what should you employ in your app, and what the popular trends of the year 2018 will be. Chatbots are a huge trend currently, and it will continue to grow in the coming years. 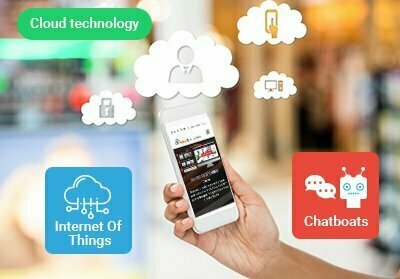 Chatbot interaction is expected to increase from just 20% in 2017 to 93% in 2022. Big brands are jumping at the opportunity to talk to their customers where they are already spending time – in messaging apps. That’s why we are seeing chatbots used in various industries, from e-commerce and fashion to more conservative sectors such as medical and banking. More and more organizations are looking to adopt this technology to improve customer engagement, customer interaction, and promote sales. While it’s a common misconception that AR is only fun, it can be used for practical purposes to make mundane tasks easier, engaging, and a lot more fun. Take for an example, the IKEA app. The AR technology allows you to furnish your home and see how your chosen cupboards, beds, or chairs will look like after you buy them. Or take the example of Google Translate. The AR features let you snap a photo of text you don’t understand, and the app uses the technology to try and translate the printed lines. The tech pundits predict that 2018 will be the year when AR goes mainstream. Artificial Intelligence (AI) is undoubtedly the buzzword of the moment – Gartner predicts that there will be nearly 20 billion devices connected to the IoT by 2020 More technology will be connected through the web and controlled through smart devices like mobile phones. With natural language process, deep learning, image recognition, and more. IoT technologies will help more and more industries such as healthcare, autonomous vehicles, and the enterprise to enhance their products, processes, and workflows and better understand and interact with people. No doubt, 2018 is shaping up to be a breakout year for IoT deployments. Whether you use cloud technology for windows mobile app development or android app development, it is predicted that more than 50 percent of global enterprises will rely on at least one public cloud platform to drive digital transformation. Cloud technology offers businesses with enhanced security over their corporate data, especially if they believe that BYOD is a not a secured option. While the year 2017 saw unprecedented development in windows mobile app development and Android app development, it is clearer than 2018 will herald even more technological advancement in the world of mobile app development. These trends clearly depict that the future is bright for mobile app development and the users that utilize them.